The Infiniti Q50 Eau Rogue Concept debuted today at NAIAS. Today at the North American International Auto Show, Nissan’s luxury arm unveiled its all-new Infiniti Q50 Eau Rouge. 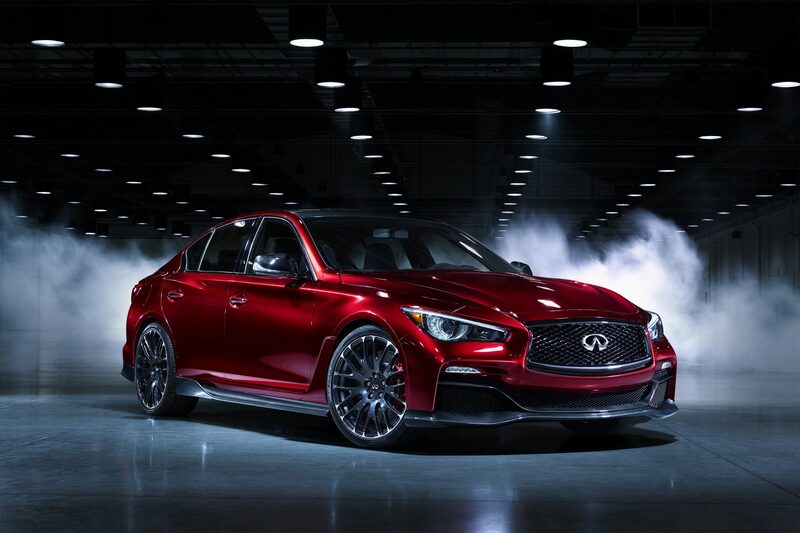 All at once, the Eau Rouge reflects the enticement of the Q50 premium sports sedan while also giving us a taste of the Formula One experience. The Infiniti Q50 Eau Rouge Concept is marked by a broadened stance (thanks to new front and rear fenders), as well as a larger deck lid spoiler. Dark chrome detailing replaces the standard chrome on the Q50, and Infiniti has added a dark-chrome matte finish to the double-arch front grille, door handles, deck lid accents, and glasshouse surrounds. In fact, nearly every aspect of the exterior serves to mirror the RB9 race car. The Infiniti Q50 Eau Rouge even breathes sportiness on the inside. The interior is marked by red-infused carbon fiber detailing, dark-chrome in the cockpit, and a high-grip sports steering wheel, along with Formula One-style paddle-shifters. While Infiniti has no plans to go forward with the concept, it quite clearly indicates the full scope of Infiniti’s capability in the segment. If the brand ever were to go forward with a performance version of the Q50, we hope it’d look something like this.